Last week, the Supreme Court considered (yet again) whether there should be any constitutional remedy for outrageous and blatant partisan gerrymanders—specifically the Republican gerrymander in North Carolina and the Democrat gerrymander in Maryland. The two cases, Rucho v. Common Cause and Lamone v. Benisek, were heard back to back over a total of 2 hours and 11 minutes. The central question at oral argument in both cases was not whether partisan gerrymandering was good or bad—everyone knows it is bad—the question was whether there is anything the Court can and should do about it. Most people think this a bit like asking whether there is anything the fire department should do when an arsonist is pouring gasoline on a schoolhouse. But to be fair to the justices disinclined to act, there are some thorny conceptual questions to address before the Court can take action against the politicians and mapmakers currently setting fire to our democracy. The ability of politicians to choose their voters, rather than vice versa, is dramatically increasing. In 2016, only 40 of the 435 seats in the House were competitive, compared to 100 in 2010, when gerrymandering was already a problem. After the 2010 census, the problem of partisan gerrymandering intensified dramatically due of a perfect storm of increased computer power, better statistical models, and more granular and more reliable data on individual voters. If the Supreme Court fails to act in Rucho and Lamone, the number of competitive seats could drop even lower and our votes will mean less and less. Not only do partisan gerrymanders reduce accountability in individual districts, they often lead to counter-majoritarian results state-wide. In the last election, Wisconsin Democrats received 205,000 more votes than Republicans, but won only 36 of the 99 available seats in the gerrymandered State Assembly. In another gerrymandered race in 2018, Ohio Democrats got nearly 50% of the vote but only a quarter of congressional seats. North Carolina is a virtually evenly divided “purple” state. Yet in 2018, where Democratic candidates won every statewide election on the ballot, Republicans won the 10 of 13 districts—just as their map makers promised them. In Rucho v. Common Cause, Paul Clement tried to persuade the Court that there was no room for the Court to assess even such an extreme disregard for representing the will of voters. But as Justice Sotomayor crisply explained in the very first question of the day: “Mr. Clement, that ship has sailed in Baker v. Carr.” If racial gerrymanders and the unequal weighting of votes (the issue in the 1962 case of Baker v. Carr) are justiciable, it makes no sense to say that partisan gerrymandering is inherently non-justiciable. Maryland’s 3rd Congressional district. Without the possibility of judicial review, there is no reason politicians will have to follow even the most basic intuitive criteria, such as contiguity. Non-justiciability amounts to a free-for-all. Politicians around the country will use all the information in their voter files and all the tricks of big data to ensure that the will of the people is irrelevant to determining who represents them. As well as the 10:3 split in North Carolina, we should expect to see a 18:0 split in Illinois if the Court holds that partisan gerrymandering in non-justiciable—anyone who thinks Mike Madigan will care about traditional districting criteria (other than the mandatory one-person-one-vote requirement) if the courthouse door is closed to complaints about partisan gerrymandering is a fool. The hardest question in partisan gerrymandering is how one can definitively say whether a district map or a statewide map is fair or unfair without simply relying on the fact that it fails to deliver proportional representation. Of course, proportional representation sounds appealing, but individual House members represent distinct geographic areas and are elected on a “first past the post” basis—both factors are likely to produce non-proportional outcomes from time to time, even without deliberate partisan bias. Justice Alito: But, if you have 24,000 maps that satisfy all of the so-called neutral criteria that you put in your computer program, don’t you need a criterion or criteria for deciding which of the 24,000 maps you’re going to choose? And implicit in Justice Kagan’s comments is the idea, is it not, that you have to choose one that honors proportional representation? To confirm our impression that proportional representation was the issue of the day, we broke the transcript in Rucho down into two word ngrams. Excluding the names of the justices, the most frequent 2grams (two-word ngrams) are illustrated below, with larger words being more frequent. 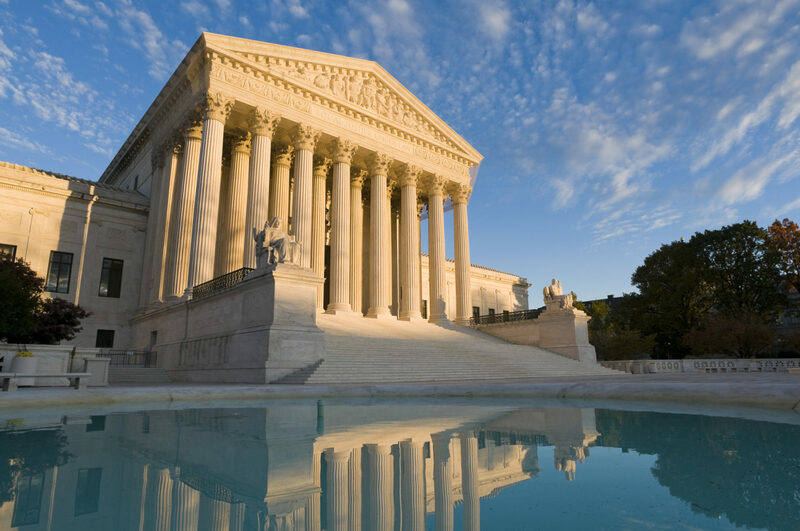 ScotusOA.com: Most frequent word pairings in Rucho v. Common Cause oral argument. “Proportional representation” was mentioned 44 times in Rucho, whereas the next most common 2grams, “North Carolina” and “majority votes”, were mentioned only 14 and 11 times, respectively. Proportional representation was also the most common 2gram in Lamone v. Benisek, where it was only mentioned 12 times. For all the angst over proportional representation, the quandary is overstated. The answer to the proportional representation question is surely that in a representative democracy with a constitutional guarantee of equal protection, we are all entitled to have our votes aggregated according to fair and reasonable criteria. A fair process will lead to something close to proportional representation in most cases, but not inevitably: respecting natural and political geography can lead to something different without violating the Constitution. The Constitution does not guarantee proportional representation, but the Equal Protection Clause and First Amendment both require that district boundaries are drawn by a fair process, applying appropriate criteria. Partisan advantage, i.e., rigging the system in favor of your own team, cannot be one of those criteria. Rucho v. Common Cause and Lamone v. Benisek are the last chance the Court has before the 2020 census to do something about partisan gerrymandering. So, with the future of democracy in the balance, how is the court likely to rule? Our predictive model for Rucho v. Common Cause is not encouraging. It shows a clear partisan split, with all of the Republican-appointed justices strongly leaning towards preserving the Republican gerrymander in North Carolina and all of the Democrat-appointed justices clearly against. Our model’s predictions for Lamone v. Benisek are a bit confused by the fact that the justices seemed to be running out of steam at the end of the second hour of gerrymander-palooza. An optimist might conclude that the brazen Democratic Party gerrymander in Maryland will make Chief Justice Roberts see that the dangers of inaction for the Court outweigh risks of entering the dreaded “political thicket”, but we are doubtful. As for Justice Kavanaugh, based on some of his questions and comments, there is an outside chance that he will defy partisan expectations, but this is probably just wishful thinking.